A week and half ago, I got a chance to visit the Country Living Fair for the first time. They say that the pages of the Country Living magazine come alive at the fair and they truly do! It was held at the pretty Stone Mountain Park not far from where I live. You might recognize some of these bloggers – from left to right – me, Rhoda from Southern Hospitality, Beth from Unskinny Boppy, and Heather from At The Picket Fence. There were gorgeous displays everywhere! This was a room that was set up by Country Living as a dining room. And check out this tablescape with those tall branch candles. I wish I had birch trees around. I would so be making something with them. Check out this huge pinecone hanging piece they had in the middle of the table. There were quilts displayed everywhere too. Then you walked out onto paths in the woods with booths set up all along the way. Antiques, homemade things, holiday displays, and all kinds of things nestled along the way. Loved this booth! These wood signs were so neat. Rhoda bought one and I can’t wait to see what she does with hers. They were sold out of the one I want so I might have to order one. And Christmas displays! Loved this white and shimmery display. And even more burlap – stockings! I REALLY want a kitchen scale but haven’t found one in my price range yet. Loved these pillows that had interchangeable covers for them. Such a neat idea. It was such a fun day! I also got to see a demonstration of a new product from Rustoleum – tile transformations. 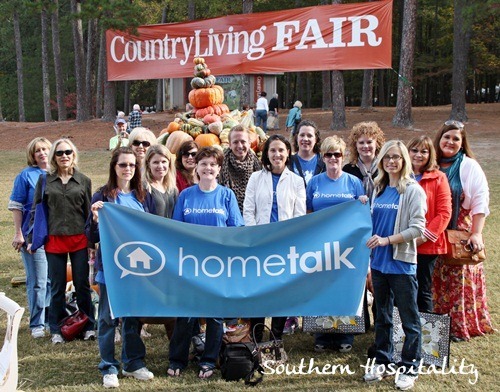 Have you ever been to a Country Living Fair? They have them in other areas of the country too. Or have you attended a fun fall arts and crafts festival – find anything fun? Great recap! It was so much fun. Can’t wait for our next meetup! thanks, Erin! Looking forward to our next meeting too! My husband and I recently purchased a travel trailer so my goal for next year is to stay in it at the Stone Mountain Park Campground and attend the fair. Can’t wait! Oh how fun! If you go next year, you definitely have to let me know so we can meet! I hope to go next year too. Looks so fun…love the pinecone centrepiece, the quilts, and the burlap pillow the best! Thanks, Beth! Yes it was a fun day – glad you came over for the day. Gorgeous pics, Christina!! Thanks for sharing, I had no idea that fair even existed! What fun! I loved all the burlap and pinecones too! I didn’t either until I connected with other bloggers that were going. It was really neat! Do you remember the name of the vendor who made the 1 Cor. 13:4-7 sign? My wife and I love that sign and would love to find the vendor and possibly purchase one. Thanks for your help and the great post!